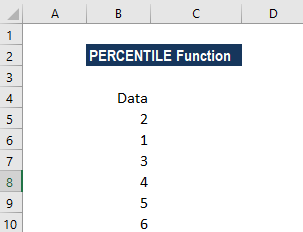 What is the PERCENTILE Function? The PERCENTILE function is categorized under Statistical functionsFunctionsList of the most important Excel functions for financial analysts. This cheat sheet covers 100s of functions that are critical to know as an Excel analyst. PERCENTILE will return the k-th percentile of the values in a particular range. In corporate financeCorporate Finance OverviewCorporate Finance involves the financial aspect of businesses wherein sources of funds are determined, existing assets invested, excess profits distributed. Corporate finance also includes the tools and analysis utilized to prioritize and distribute financial resources. The ultimate purpose of corporate finance is to, we can use the function to analyze the number of employees who scored above a certain percentile in a test. In MS Excel 2010, the PERCENTILE function was replaced by the PERCENTILE.INC function. 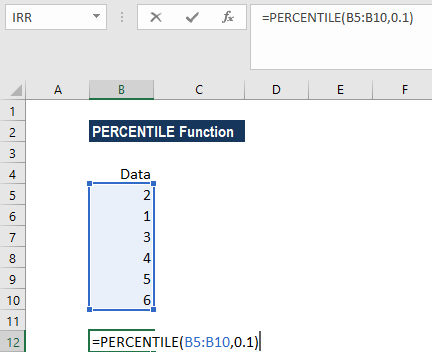 However, PERCENTILE is still available in current versions of Excel (stored in the list of compatibility functions). Array (required argument) – It is the array or range of data that defines the relative standing. k (required argument) – It is the percentile value in the range 0..1, inclusive. How to use the PERCENTILE Function in Excel? The value of k can be entered as a decimal or a percentage. So here, the value 0.1 in cell B12 is the same as 10% (the 10th percentile). Here, the 50th percentile in cell B13 falls halfway between the values of 3 and 4. Therefore, Excel interpolated to produce the result 3.5. #VALUE! error – Occurs if the supplied value of k is non-numeric. If k is not a multiple of 1/(n – 1), PERCENTILE interpolates to determine the value at the k-th percentile.